A few days ago for wanting to install an app called ScreenCast, which to use and record your androidscreen, asking you to be root. So I looked for several ways to do this and it worked easily ( in fact so far is the easiest) because it is only an application and install it now! It’s called Towelroot, which leverages a hole in the Linux kernel, which has not yet been patched in the version that was used Android 4.4.2 and it worked instantly. As you know there are many ways and not all are compatible with cell phones so the android rooting your phone thing is to try each possibility, but I recommend you start with this as the easiest of all. 1.-First I recommend installing Root Checker, that you verify after installing your android phone now has root access. 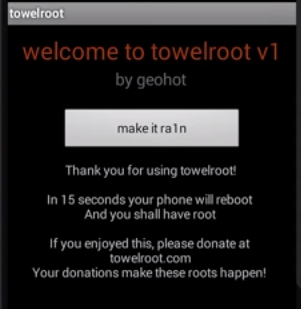 2.-Now all you have to do is download the APK Towelroot and transfer it to your phone to install it like a normal application. Once 3.- and you put the application on your phone only execute. 4.-Now you will get a warning from your device, this is normal so do not worry and select the “I understand and i still want to install it” box and single click on “install anyway”. 5. Well now just run the application and click the button that says “Make go ra1n”. 6. Now you just have to wait 15, since the application is working. You go off and phone will restart after this process. With this you can now install and use any application that needs root permissions, but remember that “With great power comes great responsibility” so now we have allowed to install whatever you want but make sure that applications are not malicious. 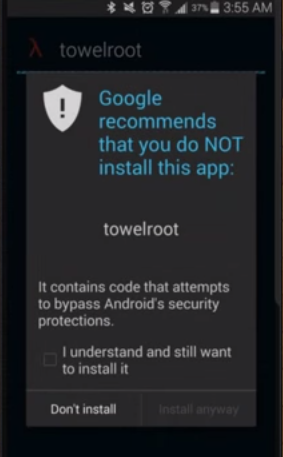 Here’s a video in the description of this Towelroot downloading application.